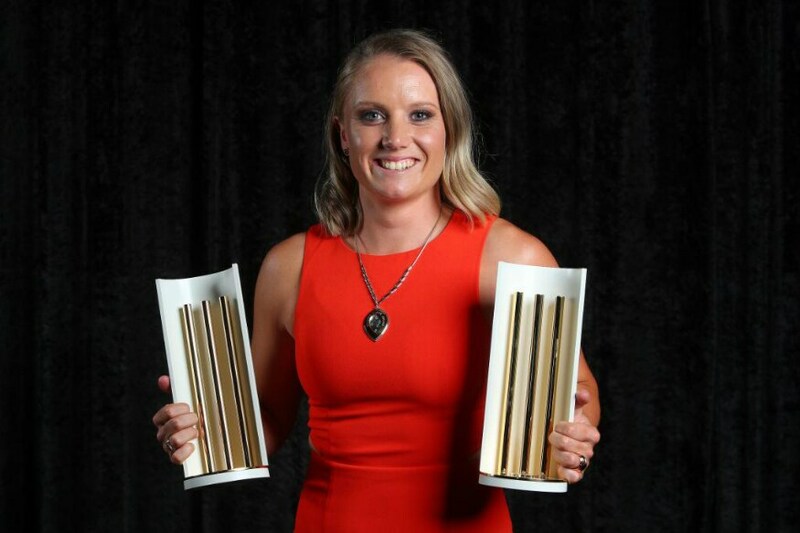 Pat Cummins and Alyssa Healy won the Allan Border and Belinda Clark medals respectively after being named player of the year in the men’s and women’s categories at the Australian Cricket awards night on Monday (February 11).Nathan Lyon, Marcus Stoinis and Glenn Maxwell were named Australia’s Test, ODI and T20 players of the year respectively. It’s the first time since 2014 a cricketer apart from David Warner and Steven Smith has won the Allan Border medal. The recognition completed a great year for Cummins, who took 36 wickets from eight Tests in the voting period (January 9, 2018 to January 7, 2019) apart from eight wickets in six ODIs. He also played handy knocks with the bat, scoring two half-centuries in Test cricket. Healy, meanwhile, won a treble after being named the ODI and T20 player of the year. She was the ICC T20I player of the year as well, having scored 225 runs at an average of 56.25 in Australia’s World T20 victory. Healy had also scored 329 runs at 54.83 from six ODIs during the period. Lyon being named the Test cricketer of the year was an easy choice; he was their leading wicket-taker in the period with 49 wickets in 10 Tests. Stoinis, meanwhile, has 376 runs at an average of 28.92 and 13 wickets from 13 ODIs – numbers reflective of the team’s struggles in the format. Australia had won just two of their 13 ODIs in the period. Maxwell played each of Australia’s 19 T20Is, scoring 506 runs at a strike-rate of 143.75 and picking up nine wickets at an economy of 7.59. He had also won the award in 2015. Matthew Wade, Tasmania’s wicket-keeper batsman, was named the men’s domestic player of the year while Western Australia’s Heather Graham was named the bes domestic player in the women’s category. Will Pucovski received the Don Bradman award for the best young male cricketer while Georgia Wareham received the Betty Wilson award for the corresponding category in women’s cricket.